The Mid State Trail is known as the longest and wildest footpath in Pennsylvania. Over 500 kilometers in length, the Mid State Trail stretches from the Mason-Dixon Line meeting a path through Maryland’s Green Ridge State Forest, near the Buchanan State Forest and traverses through the center of the state to end at the New York State line just north of Cowanesque Lake meeting Crystal Hills Trail, a branch of NY’s longest footpath, Finger Lakes Trail. The Mid State Trail is broken into four distinct regions. Hiking from south to north you will pass through the Everett Region, State College Region, Woolrich Region and the Tioga Region. The system also features several lengthy side trails. The main route of the Mid State Trail is marked by 5-by-15-centimeter rectangular orange blazes. Side trails are marked with various colored blazes. The original section of the trail, heading northeast from Alexandria on US 22, began in 1969 as a project of the Penn State Outing Club and other groups. Mid State Trail Association, a volunteer-based nonprofit, formed in 1982 to care for and preserve the path. The Mid State Trail was the first major hiking trail in America to be laid out and measured with the metric system. The MST guidebook and all its maps are described with metric measurements. Much of MST is on public land and passes through one roadside rest, two scout camps, four state wild areas, four state forest picnic areas, five state forests, eight state natural areas, and eight state parks. Large portions of MST, especially south of US 22, use six different numbered state game lands (no camping). MST also passes through about two score private land parcels (no camping, with three individual site exceptions).Other points of interest are Stone Valley Recreation Area in Centre County and the Woolrich Flagship Store in Clinton County. From the Maryland border to Centre County, the MST consists largely of rocky ridgetop trail that makes for a rugged and demanding hike, with many outstanding vistas. Beyond Centre County, the MST follows many old trails and road or railroad grades, with the occasional hedgerow. The trail also crosses several major rivers, usually via road or railroad bridges, including the Raystown Branch of the Juniata at Everett, Yellow Creek at Loysburg, the Frankstown Branch of the Juniata at Alfarata, the Little Juniata at Barree, the West Branch of the Susquehanna at McElhattan, Pine Creek at Ramsey, and Cowanesque River at Nelson. Stony Fork and Babb Creek, both deep in Tioga State Forest, are the largest unbridged crossings. The rocky ridges and thick forests provide an illusion of remoteness and solitude that is surprising for the second most industrialized state in the nation. Diverse cultural features on private land near the north and south ends of the trail add spice to the hike. The MST is rarely more than 1.25 miles (two kilometers) from the nearest road, however. The level of usage on the MST is still low, and if you hike alone, you may meet more bears than people. The MST also intersects many side trails. 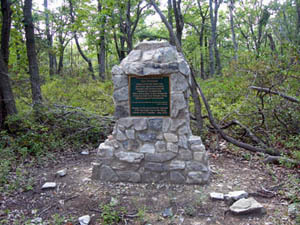 One notable side trail is Greenwood Spur in Huntingdon County, now part of the Standing Stone Trail, which leads south to the Tuscarora Trail, joining MST a third time to the Great Eastern Trail (http://www.greateasterntrail.net) footpath network. State park campgrounds along the Mid State Trail are available for a fee at Penn Roosevelt, Poe Valley, Poe Paddy, Reeds Gap, R. B. Winter, Ravensburg, Little Pine, and Hills Creek State Parks. Similar public campgrounds operated by U.S. Army Corps of Engineers are along the north end of the trail at Ives Run (Hammond Lake) and Tompkins (Cowanesque Lake) Recreation Areas. Privately operated campgrounds at Loysburg and near Waterville, Morris, and Tioga extend camping options. Primitive camping is available in many areas along the trail, and state forest camping rules apply. Camping is not permitted in any state game lands, state forest natural areas, private land (with three sites excepted) or along Penns Creek between Poe Paddy and Cherry Run. Camping permits are not required for one-night stays by backpackers on state forest lands, except in Pine Creek Gorge. If you wish to camp more than one night at the same location, contact the relevant state forest office to obtain a permit. Public-use maps for the state forests traversed by the MST—Buchanan, Rothrock, Bald Eagle, Tiadaghton, and Tioga—show many portions of the trail’s route although these may not be fully up to date. ​Mid State Trail Association, Inc.